God gives us the choice to love Him or not. I choose to love Him, and certainly not because I fear hell. I simply know Jesus turned my life around and I owe Him everything! I like this Frank – indeed Hell was not created for people but for the enemy of our souls. It’s a topic a lot of people shrink back from but I think this hits the nail on the head. Thanks for it! Well said King. Well said. Without splitting hairs (death and hell are finally cast into a lake of fire in Revelations), hell is separation from God (chosen by our free will). Personally, I think too many people in the church talk about fire and brimstone and eternal torment to sell Jesus as an insurance policy against it. The worst part about Hell would not be fire or physical pain for those that love God, but being without a connection to a being one claims to desire. I thought this was handled very well in the imagery of the unconventional “hell” in CS Lewis’ “The Great Divorce”. Have you read it? What’s interesting, Mike, is contrary to your experience, I’ve rarely heard Hell mentioned in the churches I’ve attended. And I agree with you on the worst part – separation from the One who, in the end, everyone who believes in Him wants to be with for eternity. Haven’t read the C.S. Lewis book – sometimes I find his writing a little difficult to wade through. That was the case when I tried one of the Narnia books. That said, I’ll check out The Great Divorce. Notice the word condemn. GOD condemns us. It’s too bad for us, because we didn’t choose to be born sinful. We CANNOT choose because we were BORN in sin. How can we send ourselves to a place we were already born to be sent to? Worse yet, God is the one who decided on the rules, he is the one who has determined that being born sinful was enough to punish us for all eternity. All because he decided that sin should pass through the seed of our sinful parents, whose only crime was eating a forbidden fruit. Deceived to try it ta boot! This equates to infinite condemnation for a finite crime, a crime Adam and Eve could not have fully understood. Not only infinite punishment for finite crimes of our parents, but infinite punishment for ALL their children who had no say in the matter, who grew up sinful because of how god set up the whole system. But if unjust punishments aren’t bad enough, god’s solution is to punish a person who did not commit the crime! We get a clean slate if we ‘accept’ the gift of the scapegoat. But if we don’t believe in this unjust gift, due to lack of evidence in ANY of this being real, then we don’t get a second chance when we die. Nope, we ‘had our chance’ when we didn’t have any evidence, just claims. This is the third unjust part. How anyone can argue, biblically, that we send ourselves is beyond me. How anyone can say God is just when reading the Bible is also beyond me. It requires an awful amount of special pleading and wanting god to be good. You’ve chosen to misinterpret my first point, albinogoth. Notice the word SIN. it’s not God who did it, it’s US. You, me and everyone else on this planet. So don’t blame God for calling us on something WE did. Thanks for reading and commenting, albinogoth. I appreciate it. I have not chosen to misinterpret anything. It’s very clear what you wrote, you just choose to ignore it. God condemns ‘sin’. We ‘sin’. God condemns us for our ‘sin’. How can you argue against your own point? Let’s use an analogue. A judge must condemn crime. If I commit a crime the judge must condemn me. The judge condemns me for my crime. You cannot say I send myself to prison. The judge does that. You can argue wether I deserve to be judged, you can argue wether or not the punishment fits the crime, but you can’t say I send myself to jail. 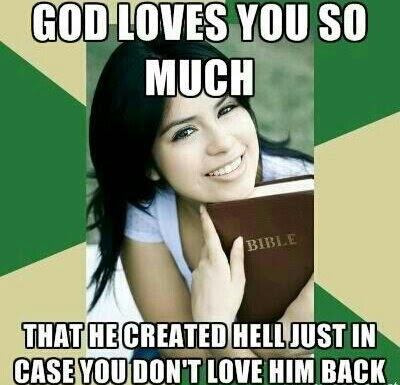 In this same way you can’t argue that god doesn’t send you to hell. If you wish to disagree, please give reasons and analogs to present why. If you’re willing to say god condemns us, then say so! Pretending we send ourselves is dishonest. That’s my main point. We can discuss the immorality of the concept of sin, original sin, and eternal hell another time. As far as being born in sin, if you’re going to discuss that people are sinful, it might be good for you to struggle with the concept some more. Most Christian theologies that I’m familiar with state sin is not just what we do, it’s what we’re born into and do by nature. I struggle with all kinds of things, albinogoth. It must be wonderful not to struggle with anything and have all the answers. I certainly don’t. You are also struggling with not being a jerk. When did I claim to have all the answers? Try struggling with being honest and not pretending. Try struggling with actually addressing what people say and not acting like a politician with your answers. Do you want discussion or do you just want to preach? You made a claim (God doesn’t send us to hell) and I challenged that (We don’t send ourselves to hell, just as criminals don’t send themselves to jail). You did not address my points, you just ignore them and then insult me when I press the issue. I want a discussion, I want the struggle. I’m not interested in insults that pretend to be modest. You can try again to actually address my points. I won’t hold your lapse of civility against you. We all do it sometimes. It’s only human. I did address your points. If you want scientific evidence for what I’m talking about, you won’t find it. I don’t have all the answers. I’ll NEVER have all the answers. If you want to condemn me or my FAITH for that, go ahead. I’m not asking for scientific evidence! Where in the WORLD would you get that idea? I point this out. God sends us to hell. He condemns us. Then you say I missed the part about SIN. No, I didn’t. God CONDEMNS us. I gave you the analog of the criminal. The criminal is judged and condemned. That means the judge sends him to prison. The criminal does not send himself. The same works for the concept of sin! God (the judge) sends sinners (criminals) to hell (prison). If this analogy does not work for you, then perhaps you could tell me why it doesn’t work and describe your concept a little more in detail. “Don’t do the crime if you can’t do the time.” It’s as simple as that. We condemn ourselves when we do the crime because, one way or another, we’ll do the time. That’s where I’m coming from. If that doesn’t make sense to you, then I guess we’re going to agree to disagree. But why is the punishment hell? Because God made it that way. He decided that was the just punishment. You can’t say God doesn’t send us there when he does. “Don’t do the crime if you can’t do the time.” only makes sense when we have a system where criminals are sent to jail for crimes. If this is your model, you don’t believe we send ourselves, you just believe we are guilty and god MUST send us to hell. The punishment is Hell because God decided the punishment is Hell. When you start the universe, create planets and the very air all of us breathe, I imagine you have that right. And there’s ALWAYS a way out of that punishment. It’s trusting in and following Jesus. That wipes my crimes off the book. That wiped the crimes of the Son of Sam off the book – even though he quite rightly will never leave prison for what he did (http://wp.me/p2wzRb-6K). So you agree. God decided the punishment, God decided the criteria, ergo God sends sinners to hell. Right? So I don’t agree. God decided the punishment when WE DO THE CRIME and don’t trust in what Jesus did for us to wipe that crime off the books. It’s my choice and it’s your choice. What? That makes no sense. You agreed that god decided the punishment. That alone is enough to say he sends sinners to hell! Never mind the references in the bible where he literally sends people to hell! It makes perfect sense to me and to serious Christians. Nobody is forced to do wrong. Nobody. And yet we voluntarily go out and do it every day, almost always with the full knowledge that it’s wrong. That’s not news. My neighbors are noisy. I told them to be quiet or else I would set their house on fire. But they kept being noisy. They knew they were being noisy and they knew I was going to set their house on fire if they weren’t quite. So I set their house on fire. They weren’t forced to be noisy. They were voluntarily noisy. Therefore they set their own house on fire. Now the above example is unjust, of course. But we aren’t discussing the justness of the example right now. We’re discussing the ‘we send ourselves to hell’ concept. It doesn’t work. Your neighbours are noisy – knowing full well they’re disrupting the community and someone will likely call the police on them – and they just continue being noisy. So when the cops show up, they’re gonna say “how dare you charge me with noise violations”? Really? They brought it on themselves. And it wasn’t a fellow wrongdoer setting their house on fire. That’s not what I’m saying. You obviously don’t care what I said or wrote. In fact your example is perfect because that was my first example! I never said the criminal doesn’t deserve punishment. I never talked about the justness of the crime for this point. The cops come by they write up the violators. They haul off the criminals. The violators don’t give themselves the punishment. No, they incur the punishment. But the law condemns and the law sends them to prison, writes a fine, executes, etc. If by ‘you send yourself to hell’ you mean ‘you incur the wrath of god’ then I agree. But those two statements are not the same. The police send you to prison, god sends sinners to hell. You know, it almost seems like we’re just talking semantics here. And it’s quite the generalization to state I “obviously” don’t what what you wrote. We’re just not on the same tracks here and I don’t see a way to fix that. Of course you don’t. First of all you don’t give me a clue if what you mean by ‘we send ourselves to hell’ is ‘we incur god’s wrath’. If it is, then I know what you mean, but then I’ll have to say the phrasing is technically wrong as I’ve shown. If you don’t interact with what I say but assume things I didn’t say (like I think I know all the answers and I’m demanding scientific evidence) then I don’t see how you can ever fix a misunderstanding. Well, thanks for your comments, albingoth. Is this another insult? You don’t confirm or deny my guess of your meaning and just ‘thank’ me for my comments? I’ll try to assume it isn’t, but it’s seriously coming across that way. If you’ll pardon my intrusion into your conversation, I would like to add my views in the best way that I can. No one can give you a satisfactory answer to your questions apart from the Holy Spirit. Each of us has been given as much of an explanation as they required. So, each of us has a partial understanding. That said, here is mine. God is infinitely just. He is governed by His nature, His revealed nature to us is known as the Law. When Eve was deceived, it was satan’s intention to bring about condemnation upon a creation that he hated, by a God he hated. What he did was cause her to transgress that Law, knowing that the condemnation was to be death. However, as great a created being as he was, he didn’t fully understand the intricacies of the Law, and most importantly, the breadth of God’s Grace. This theme is repeated time and time again, up to satan tempting Jesus and beyond. It is apparent upon studying the Scriptures the fact that satan feels that the Law is God’s “Achilles’ heel “. He has tried many times to use it against HIm; to manipulate God through His Law. It is true, with transgression of the Law carries a sentence of hell, and it is eternal. But, there are two judgments given in the Bible; one for believers, and one for the unjust. Neither decide where the soul is headed, but only degrees of reward and punishment. Truthfully, we don’t know what encompasses this place called hell, but we do have what it is likened to on earth. It’s hard to imagine degrees of punishment in a place like that, but we are told there is. Now, its purpose is both punishment and separation. Was it designed for the former, or is that just a necessary inheritance of the latter? Rather than take it as God has condemned man to eternal torment, it may just be that this is the result of separation from our creator. That separation is a necessary result in restoration of the Kingdom of God. Man is an eternal creation, I do not know why annihilation isn’t an option, but it clearly isn’t. So, the question would remain; “Why would God allow this?”. It is answered in the Scriptures where we are revealed as being greater than the angels. We are weaker, fragile and without the capacity for knowledge that the angels possess, so how are we to be greater? The answer is in that the angels have always beheld his face, and those who fell from Grace did so with a full, revealed knowledge of the character of God. They directly rejected God. To contrast that, we “see but through a glass darkly”; we act in faith in a sin-filled world to seek and trust that which we cannot see. We understand only a glimmer of the righteousness of God and act in complete faith as children to be conformed into the image of His Son. In essence, we will have undone the evil of the fallen angels, satan and proven for eternity the justness, glory and righteousness of God. We do so by faith –faith in what we were blinded from ever seeing by sin. Thus, the power of sin is destroyed in us –we will forever be a testament to the greatness of God, and the condemnation of sin. I’m not sure if they satisfies all your points, but my basic intention is to impart a view that hell is a necessary juxtaposition to heaven, when sin intrudes. Hell wouldn’t have to exist if sin hadn’t entered in, but the consequence was always there apart from the reality. You cannot have love without hate, but hate never has to enter into a relationship. But the true value of love is found in its opposite; otherwise it is without choice and determination –it becomes valueless. Thanks for telling me what you believe. I’m actually quite familiar with various Christian stories and understandings. You didn’t actually address my questions, but thanks for trying. However, I do have some questions for you now, if you’ll indulge me. 0. You said god is infinitely just. How do you know this? 1. How do you define sin? Why? 2. In your understanding, how does God deal with the unbeliever who never heard his word? Namely a) people of the past or remote places who never had a chance to hear the gospel (or the law for that matter) and b) those who do not believe because they don’t see the bible as enough evidence to support the claims of a god. If you wish to respond, please do so, but do not go on lengthy sermons. I’m curious why you believe these things, I don’t need a recap on your particular variation of Christianity. Well, for some reason I am unable to reply directly to your post, so you won’t be notified of my reply. 0) This goes without saying because it logically follows. In fact, it entirely encompasses question 1 as well. I find it difficult to explain such weighty matters without going into great detail, but I will try for brevity. Simply, if there is a God, and He created man, the universe, the laws of science which govern it, then surely He defines righteousness. 1) I do not define sin. In fact, the Bible is very clear that sin doesn’t exist, apart from the Law. I don’t believe that the Bible means this in the sense of “does a tree falling in the forest with no one around make a sound?”, but that truly sin is just an action, neither good, nor bad. However, once defined by the Law, it is given over to becoming a force in this universe. I could go on, having studied esoteric philosophies, having know individuals involved in magick, but that is the basic premise I am putting forth. As for how I personally define sin, I look toward the Law (the ceremonial laws have been done away with, yet they existed to illustrate a premise), and am guided by the Holy Spirit within me. The latter I can never explain to your satisfaction. 2) I was really surprised you didn’t bring this up sooner. All I can say is, I do not know. A man who’s teaching I greatly admire, G. Campbell Morgan, once stated that he too didn’t know. Paul states that God is revealed in nature and that natural man has evidence to the existence of God. I don’t rule out that those who have never heard the name, have never had the truth revealed, might not have a chance to hear the Gospel message from Sheol if they had responded in faith to whatever witness they had on this earth. Many would condemn that response, but I know they don’t know either 😉 One thing I do know, and that is that no one will see heaven apart from Christ. The Bible isn’t evidence of God, it is a book. It is the voice of God through the words within the Bible that are evidence. It is the action of the Spirit upon our spirit that is the witness. Many have had that and still rejected the free gift. My question for you is; why are you here asking questions? You see, I was brought up in a church, having godly grandparents and my grandfather being a minister. I hated the church. I despised the weakness of those who were in the church, yet, I never sought to change their minds, or trip them up in their beliefs. You see, they were beneath me, and of no regard to me. I simply moved on to get on with my life, living it as I saw fit. As to why I’m here asking, here specifically I’m asking because of a statement that I feel was trying to ignore the character of god’s responsibility in the matter of sin and hell. As you mentioned, god made the rules and made us knowing we could not fulfil the rules. For either one of those, the character of god as described in the bible is culpable for human beings going to hell. Literally he sends the unbeliever to hell. As to why I ask questions in general, well, my background is almost completely opposite yours. I grew up in the church, my father being a minister. However I loved the church and I loved god. I loved reading and growing. But I knew the ‘answers’ but didn’t really know why other than god said so. It was ‘true faith’, like the faith a child has in their parents. A little bit during college, but very much afterward, I started reading the holy books of other religions and tried to understand what they believed and why. But when I turned that same idea on myself I found that it didn’t make much sense. Explanations often turned into excuses rather than anything that made sense. The best defences could work just as well with other religions. So in short, I occasionally ask, both so I understand what others believe and why, but also to hone my own thinking skills and, if there is an important truth to find, to come across it. I find that discussion, particularly asking questions, is the highest form of respect. I’m still working on doing that effectively. 0) I don’t see how it logically follows that god must be just. For sake of argument, I will assume god exists. a)So, if there is a god, and if he created the universe, including humans, and the proscribed the workings of the universe… how does that lead to him being either the author of justice or himself being just? Again, I don’t mind details so long as they’re relevant. b) Remember my initial question was how you know god is just. Saying god is just because he defines justice does not make god just either. Case in point, god says it is unjust to punish the son for the father’s sin, or the father for the son’s sin. Yet many curses he gives go down through the generations and the first born of Egypt was punished for Pharoah’s hardness of heart (which was itself debatably hardened by god). How do you account for the apparent injustice the character of god does or commands? 1) Interesting. You say sin does not exist apart from the law. a) So if god had not made a law, there would be no sin? b) In that case, when Cain killed Able, it was not a sin? c) How do you determine wether human laws are just or unjust? Can this also be applied to god’s laws? 2) Well, it takes courage to say you don’t know when you don’t know. It’s honest and I like that. Your guess (perhaps they’ll hear about it in Sheol) actually sounds very much like the Mormon solution. Though they also believe that the person, even after accepting Jesus in the afterlife, still has to be baptised in this world, which is one of the reasons for their extensive genealogical research. They ‘baptise’ as many dead they can in hopes that they’ll accept Jesus. a)I know this is just a hunch on your part, but why is that your guess? I noticed you ignored the second part of the question though, So I’ll ask it again. b) How does god deal with the unbeliever who does not feel there is enough evidence to allay their doubts? Thanks for your time. I know that opinions regarding religion vary greatly between people. I’m trying not to assume too much in case my assumptions are not in line with your thoughts. Before we start, I have to point out how illogical your question is. If God creates a reality and a universe, then populates it, then of course He is the final say in what is righteous, and what is not. All definitions of all things proceed from Him. It exists totally within Him, only if it were to exist outside of Him could this be question, in which case He would not be God. It’s like claiming an author is wrong about the events in a fictional novel. God has no culpability, He did not design man to reject him, the law of atrophy, nor any of the other things we see in this present world which directly oppose His nature. We were made perfect and without sin, in a world made to operate in perpetual harmony. Only through the introduction of sin was the creation spoiled. Yes, He knew sin would enter in, but ample warning was given and a plan for redemption was already made. I have given some of my thoughts already as to why I feel He did this. The rest of your story of searching pointedly shows you are seeking God through the reason of your mind. While I have made that same journey myself, I have to tell you that you will never complete that journey without the Holy Spirit and the exercising of faith. God isn’t found apart from relationship and exercising at least a kernel of faith. b) They are totally unrelated. One is dealing with the actions of man with man, while the other is God dealing with man. Why would you equate the two as being equal? That’s akin to discovering someone guilty of a crime punishable by death and walking up to them shooting them in the head. The system would have done it anyway, yet that same system would find you guilty of murder. You simply don’t hold that same authority. a) As I mentioned in my original reply, the Law isn’t to be considered as an earthly decree, but a vital extension of the personality of God Himself. b) The declared, or written Law is superseded and a pale shadow of the Law of God, which existed before this universe was created. Also as I mentioned, we are told that there exists a residual primeval version of the Law left over from before our fall. We are also told that Cain knew he had done evil and tried to cover it. Therefore, Cain sinned. c) I struggle a great deal with the law as it is written in the US and other countries. In some areas I vehemently reject their thoughts, in others, I ponder, but am thankful I am not accountable for deciding upon their justness. If I understand the latter part of your question, you are asking if I can apply that same skepticism to God’s Law; most decidedly not, the creature can never judge its creator. Besides what I’ve already outlined, I know and understand only in part of what lies beyond my perception. I am simply not fit, and that can be said about my judgment of man’s laws as well –my experiences are limited and my understanding is based upon those limitations. Most likely what you are seeking from me is that, yes, I have difficulties with laws where no one is harmed, or their rights are infringed upon. I can’t help but find laws which create criminals simlply by their existence as being just. But again, there is no correlation between that and the Law of God. These are not decreed statutes meant to entrap man, they are vital expressions of the personality of God which are required in order to remain in His presence. We must be holy as He is holy. Sin corrupted, not just a man but, an entire creation. 2) I never even intimated that my ponderings about the fate of those who’ve never heard the Gospel was a “guess”, or a “hunch”. It is simply something I have entertained, and something I have not ruled out from Scripture. I would never teach this, nor claim that I even partially believed this. I am familiar with Mormon doctrine and eschew even the discussion of it. I will say that baptism is symbolic and ceremonial, anything besides faith in Christ is adding to the Gospel. As to the reference to Sheol, that comes from Jesus originally descending to retrieve the Old Testament saints to be reunited with Him and God. I will admit my notion of Sheol comes from the Book of Enoch, and some of my theology has been directed by writings of the Ante-Nicene Church Fathers. In respect to Frank, I choose to not delve heavily into those areas. This is simply not the place for it. To get back to your question, It is not a belief of mine, but a muse. Perhaps if it concerned me more I would have a been given a more complete answer. But, somewhere along the line I began to have more of a trust in God and quit searching because I am convinced that when I am given complete knowledge I will understand the reasons. It’s those things which truly bothered me that have been revealed to me over time. I never ignored any of your questions, I worked solidly from morning to evening and both body and mind were exhausted, and actually I still am. Simply, evidence does not beget faith. Abraham was counted as righteous by his faith, so are we today upon the finished work of the cross and Christ as our saviour. Our natural mind is at enmity with God, and it is in opposition to God. Now, a different kind of evidence can be produced through faith. The Word is replete with promises, one can realize those in their life. Some are subtle, but some are demonstratively blatant. Yet, nothing will ever be so concrete as to supplant faith. Thanks for taking your time to reply. I know you are busy, but I do enjoy this discussion. 0) I would have to say my question was not illogical. You are assuming justice is something defined by god. I will not grant that. Please show me, logically, how being a creator allows one to define justice however one pleases. I will concede that having absolute power allows you to do what you want with no repercussions. But how does that make it good? How does that make god’s actions just? b) Why would I equate them? I’m not. I’m asking why the apparent dichotomy. For example, parents can make rules that they don’t obey themselves. These are for developing good or healthy habits. But the kid is told they can change the rules when they are older. But other rules, not harming others, not stealing, etc, are rules the parents should also follow. Sure, occasionally there are exemptions, but good reasons need to be given for the exemption. Saying, “don’t question me” is a terrible reason for hitting a child. Usually we associate that answer with child abuse. Yet this is basically the answer we’re given when faced with the divine dichotomy of ‘do as I say, not as I do’. I’ll admit we cannot know everything. But that’s even more of a reason that god should give better explanations for committing and ordering genocide (among other contradictions). 1) a) You said that the actions we call sinful are neutral until defined by the law. You also claimed that these are a force like unto the ‘laws’ of nature. This is an assertion that I will not accept either. Please give your reasons for declaring they are a ‘force’ rather than a proscription. b) How can the law of god exist before the universe was created when it deals with our relationships? I’m assuming you mean ‘before’ in a different sense we normally use it. No need to go further since the questions here would diverge too much and would be more related to the existence of god, not the justness of his character. I suppose I would need to know if you take Genesis literally. If so, how is the temptation, obviously allowed by god, not a decree meant to entrap Adam and Eve? If you don’t take Genesis literally, then this question is, of course moot and I’ll refer to the question in 1a. But back to the actual topic, you still did not directly answer the question, but answered indirectly. Let me rephrase it a little bit. Perhaps you did not understand where I was going with this. *How does god deal with the unbeliever who does not feel there is enough evidence to ally their doubts and who then dies? According to the bible, such an unbeliever will be sent to hell forever. All because he used the mind god has given him to determine there isn’t anything to the claims. You can’t reject a gift you don’t believe exists. Unless you have fundamentally different answer, you don’t have to reply to this one. This seems like a contradictory statement. I would like to understand how a perfect being could sin. As an example, let’s say I make a robot and it looks perfect to me. The first day all the trials for walking work perfectly. The next day I test it on some stairs and it falls down. I don’t blame the robot, I blame my own design. Yet god isn’t culpable for our design flaw? He is perfect and all knowing. Would he not know from the outset that we would fail? That is, by definition, being culpable. Now many will say that freewill is the answer. I don’t see this as an answer at all, because we could still have agency and, being perfect, we wouldn’t sin. We couldn’t sin because that is the definition of being perfect! Cool. Your humility on this subject is heartening. Whoa! You don’t understand everything about hell, but you do claim to know the truth about it? Ah ha. I see. Erwin McManus. And….what was the source of his authority on this question? No. This does not make sense. Please tell Edwin that nothing in that verse precludes it being a destination for human souls as well, and there are plenty of references to eternal damnation in the new Testament. And yet, Bruce, you have failed to negate that Bible passage. It still stands, no matter what you write. If you want to make the leap to including humans, that’s your business. Where did I try to negate it? Why would I care about negating it? Please read my post again, more carefully. I read your post again and my point still stands. You want to read more into that Bible passage. That’s your business, Bruce. Oh dear Frank, you accuse others of ‘reading into’ the bible yet the very verse you quote shows God condemning people to hell. Yet you insist ‘we send ourselves’. Talk about ‘reading into’ the bible. Yep, god sends us there. Clear as day. But you can’t say that, because… actually i don’t know why you can’t admit the simple fact. I’m not reading “more” into that passage. I don’t know how I can make this any simpler for you. Again, basic logic and critical thinking. If A and B are not exclusive, then given A you cannot rule out B.
I disagree, Bruce. You’re putting words into Jesus’ mouth because it suits your point of view. Maybe you should just ASK him where he gets his idea instead of accusing him. It’s true that if A and B are not exclusive then A does not rule out B, but neither does that support B. You need evidence to support B. Then go with that viewpoint, albinogoth, since it suits your viewpoint. And I didn’t “accuse” Bruce of anything. Again, that’s your viewpoint. Your bible is pretty clear on the subject. You might want to let Erwin know…. Yes, but that still DOES NOT for a moment mean that Hell was created for humans. You are reading your viewpoint into more Bible passages, Bruce. So you do believe that he’ll is a place of eternal torture and that people will be sent there? And you also agree that God is a timeless being with perfect foreknowledge? Then when God created hell he did so knowing that it would be employed as a means of torturing humans. How can you then say he didn’t create it for them, as well as for Satan? Bruce, I believe Hell is a place of eternal separation from God. And as for who God is, I start with the FACT that God is a mystery and there is all kinds of stuff I won’t know about him until this life is over. This is important for me; as I’ve often stated, it’s a powerful reminder that God is God and I am NOT. The question at hand was whether your God created hell for humans. Since you did not address or even attempt to refute my argument, we can take this as settled now. I’ve already pointed out how that verse is not relevant. Don’t jus repeat yourself, Frank. Address the argument in my last post from Nov. 28. Show me where my premises were wrong or my logic invalid. If you want to believe that scripture verse is irrelevant, that’s your business, Bruce. And sorry, but your viewpoint isn’t the be-all and end-all of everything. I demonstrated that it was irrelevant with a logical argue that you failed to even try to refute. If you want to continue to believe that logical reasoning is irrelevant then, well, I guess that just makes you a Christian. But your viewpoint is completely unsupported by either facts or reason. So glad you think you won the point, sqlblindman. We’re never going to see eye-to-eye because you worship science and I worship God. So thanks for commenting. What a ridiculously ignorant thing to say. Science is a process. How can one worship a process? You might as well say I worship “brushing my teeth”. Honestly Frank, this is just pathetic. You blog on this stuff frequently enough that there is no excuse for not understanding truly basic concepts. I understand very well what worshipping science is. And my point stands. So let’s end this conversation that’s clearly going nowhere. You’ve made your points and I’ve made mine. Goodbye. No, you have accused me of “worshiping science”. If you have any integrity you will rescind that or defend it. In what way do I worship science? I agree with Frank when he said that God doesn’t send us to Hell; we choose by ourselves. Actually, this planet was created as Heaven by the Creator so that we could live in peace, but people are misled by evil forces (Satanic), people are confused, they lost their faith in God, that’s why we cannot have peace. Personally I don’t believe there is a place like “hell”; it is the excruciating & agonizing (mental) experience that someone goes through after doing a bad thing. Thanks for your mature, respectful comment. Those traits have been in short supply lately. Even if god created hell for satan, he had to know it would end up filled with billions of people. And we send ourselves there!? So when I die, am I going to jump into the lake of fire myself, or is god going to put me there? My not blindly believing your particular religion means I’m choosing to put myself in hell? There are people from other religions telling me the same thing, so why should I believe you? I could go on and on. This is the worst kind of fundamentalist Christian thinking. Thanks for your comment. Are you an atheist person? If yes, then Frank’s Cottage isn’t meant for you. It’s written for people who are open to spirituality.